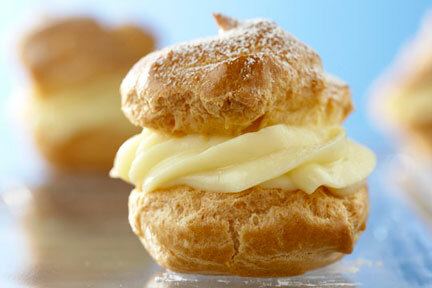 January 2nd is National Cream Puff Day! While the origin is obscure, the cream puff was introduced in France by Caterina de Medici, the wife of Henry II of France. The “cream puff” first appeared on US restaurant menus since 1851. The world’s largest cream puff weighed 125.5 pounds. The Wisconsin State Fair is known for producing cream puffs since 1924. Happy New Year, Beautiful People! When I discovered that today was a National Cream Puff Day, I couldn’t resist sharing this post with you. One of the reasons I love profiteroles is that supposedly the recipe originated in Renaissance Florence. Unfortunately, I have not been making them ever since milk and butter made their exit from my kitchen, but watch this excellent video, and enjoy making your own! Cream puffs are my specialty, and here I didn’t even know it was their day. My mom taught to make authentic cream puffs years ago. It is difficult since you need to beat air in to the mix with a wooden spoon to help them rise in the oven. Mine aren’t open like the ones shown. I insert the different fillings with a plunger-like device. I can make them from bite-sized to fist-sized. Thank you for letting me think about my late mom, and the wonderful times we had as she taught me to bake. Your post brought back great memories.